Hershey Felder as Irving Berlin. In these-fear-filled, xenophobic times, here’s a show that’s the perfect tonic. Irving Berlin came to America in 1893, at the age of 5, after he and his family had watched the Cossacks burn down their entire Russian village. He was so poor that when he left his Lower East Side home to make his own way, at age 14, he slept on stoops or a park benches. He started out selling newspapers for a penny apiece, then became a singing waiter, and ultimately, one of the world’s most beloved songwriters. Through it all, he never lost his sense of gratitude for being able to start his life over and live in freedom. Berlin lived for 101 years (he died in 1989) and he continued to be driven by genuine, unwavering American patriotism; he was compelled to give back to the country that gave so much to him. Take that as an example of immigrant attitude, Donald Trump! In every one of the 1,500 songs he wrote, Berlin put his emotions, his personal experiences — and singable colloquial English. 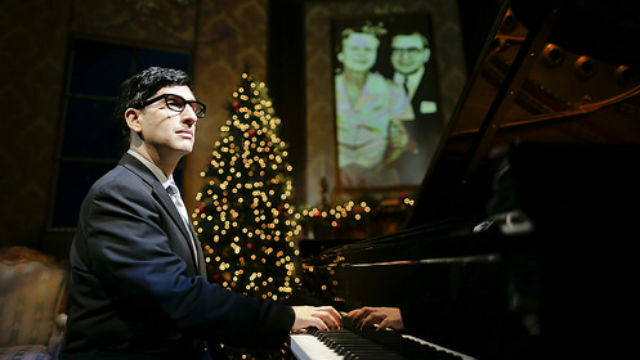 “Hershey Felder as Irving Berlin” is a perfect matchup of two talented men. The Canadian writer/singer/Juilliard-trained pianist has brought a range of composers to life onstage, from Chopin to Beethoven to Bernstein. But, he’s met his ideal dramatic and musical counterpart in Berlin, whom he portrays with just the right amount of Jewishness, sentimentality and schmaltz. This latest show, which he premiered in Los Angeles and has brought to several other cities, has settled into the La Jolla Playhouse for a few weeks — and it’s a knockout. Felder is in excellent voice, and he handles the many piano flourishes, embellishments and Big Finishes with aplomb. He also gets to display his impressive skills as a mimic: he does a mean Ethel Merman, and captures a score of others, from his cantorial Yiddish-speaking father to the gruff, demanding producer, Flo Ziegfeld, and other high-spirited New Yorkers (though he doesn’t quite nail the Noo Yawk vowels or antsiness). The setup is Christmas Eve; the snow is falling outside the window; a tree and holiday lights sparkle in the cozy living room (Berlin always identified as Jewish, but his beloved wife of 62 years was Catholic, and Christmas was her favorite holiday, we’re told). Felder co-designed the set (with his director, Trevor Hay), which is frequently enhanced by wonderful projections (Andrew Wilder & Lawrence Siefert) that bring us to a wide range of times and places. Outside the apartment, carolers are singing Berlin songs, and Berlin’s younger self, talking to the wheelchair in which he’ll ultimately turn into the older, curmudgeonly recluse Berlin, invites the carolers in — for the first time in 26 years. That makes it clear who we, the audience, are supposed to be, and justifies the singalong element. The rags-to-riches story is compelling and touching (Berlin lost his first wife just months after their wedding; a baby with wife no. 2 died on Christmas which, along with the troops he often wrote for, gave “White Christmas” a particularly personal poignancy for him). There are brief clips of Merman, Al Jolson, Fred Astaire — and even Berlin himself, a spirited, if untrained singer (he also taught himself piano and famously only played the black keys, though he had special pianos — and skillful musical secretaries — to transpose his work). Overall, it’s a moving, inspiring and thoroughly enjoyable evening of story, song and nostalgia. Performances are Tuesday at 7:30 p.m., Wednesday at 2 p.m. and 7:30 p.m., Thursday-Saturday at 2 p.m. and 8 p.m., Sunday at 2 p.m. and 7 p.m. Special holiday performances are Dec. 23, 24, 31 and January 2 & 3.